Do we really NOT know how to cook? Yesterday I read an article that included a survey showing that 28% of Americans can't cook. I believe that. I can't really cook. I don't like that fact either. It's just plain sad. If it wasn't for 7th and 8th grade Home Economics class, I'd really be in trouble. I semi remember some of what I learned. I grew up with a working mom, who did cook, but neither she or I had the desire to get me in the kitchen to help out or learn anything. And, I'm paying for it now. I spent my early adulthood eating crap, got married, had kids and we still ate crap. Fast forward to this summer and my husband nearly lost his life to Ulcerative Colitis. The eating crap has to stop. So, I'm learning to cook and to preserve and to simply..slow down..all of it. Because, I don't want to go back to eating all that processed crap food and the lifestyle that it entails. I don't want that life. Speaking of good, homemade food. I made pesto. I'm still in shock myself. 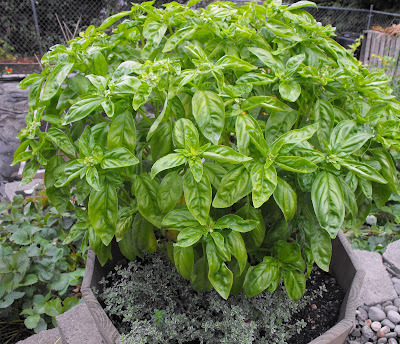 I grew this beautiful basil plant all summer. I used this base pesto recipe but omitted the nuts (one kiddo has a nut allergy) and the cheese as I froze the pesto in ice cube trays. I will add the cheese back in when I use later this year. I did add a bit of lemon juice to the recipe as well. My old (and I mean old) blender did fine to mix it all up. Any suggestions of tasty additions in substitution of the nuts? Oh, I believe most Americans don't know how to cook - or very limited. Like you, I married and cooked the few meals I knew - tacos, spaghetti, some casseroles. But with growing your own, comes a desire to cook these fresh herbs and vegetables. So I, too have started actually cooking (Julia Child is still the best teacher!) and find I feel so much better. It takes time, but it also takes a bit of love - something that was always missing in my "so-called cooking" before. Try some sunflower seeds in place of nuts? Blend them up and mix them in with the cheese. My old roomies in Eugene used to make pesto and freeze it on quart size milk cartons, cut the top of the carton open, then fold it back down, and tape shut with masking tape. Seemed to work pretty good. I was just chatting w/ a friend today about pickling beets, maybe if I'm brave enough I'll try it out! When I first started teaching primary children we baked and cooked and then the national curriculum was dictated and we hadn't time left in the day. Cooking and baking should be a compulsory subject in schools. It's also much cheaper to cook your own. My husband did the supermarket shop today and said he was briefly tempted by an offer of a complete meal for 2 for £10, but then he came to his senses when he looked at all the fat and sugar and salt that was in the ready meal. So we had baked potatoes with salad and garlic and chilli stuffed queen olives. 2 baking potatoes = 84 pence. Lettuce £1.30. Olives £3.00, with loads left over for other meals. Even tho we both work full time outside the home we always cook 'from scratch' every night. It has rubbed off on our children - our son who is away at university now is able to cook for himself using fresh ingredients, and our daughter will be able to do the same. You'll be giving your children a real gift. Jenni, as you know, I'm a strong advocate of passing on knowledge about growing and cooking to the younger generations. Have you seen my daughter Emma's website - Mellow Mummy (link in my side-bar)? She is teaching her daughter Lara about cooking already, and Lara is only two. She loves it! In our family, food is normally "from first principles" - that is no pre-prepared ready meals etc. It's much healthier, and very satisfying to cook & eat like that. P.S. Parmesan cheese in pesto freezes OK.
Hi Jenni, I just discovered your blog. What you're doing is great. Everyone should know how to grow food and feed themselves. I can't believe people don't see this as essential. There are lots of apartments being sold now in cities that don't even have a kitchen, except perhaps a microwave on a bench and a fridge/freezer. This is insane. Okay, end of rant. I'm enjoying your blog. Can't cook or just don't want to cook? I can't speak for America but I've always been able to cook, [self-taught] but I've never much enjoyed it. [Love eating though!] Motivation is a big factor. I think your husband's illness can be a great motivator for of us, Jenni! Good idea with the sunflower seeds. I hope your pesto is yummy. Shocking Moment..I made tomato sauce!